A couple of customers turned café owners are celebrating their first ten months in business with the introduction of a new drinks licence. Paul Winterburn and Jane Dunning gave up careers in banking and further education to take over their favourite eatery, the Arthouse Café in Penistone, in January this year. The food and drink lovers have now developed a new menu, with more free-from options, and gained an alcohol licence for the premises. Paul and Jane plan to introduce themed evenings serving freshly-prepared food, wines, craft ciders and beers soon; and, in 2016, they aim to extend upstairs to create a new events space -and new jobs too. Their business’ expansion plans are being supported by Barnsley Business and Innovation Centre (BBIC), through the Enterprising Barnsley programme, which is funded by Barnsley Council. 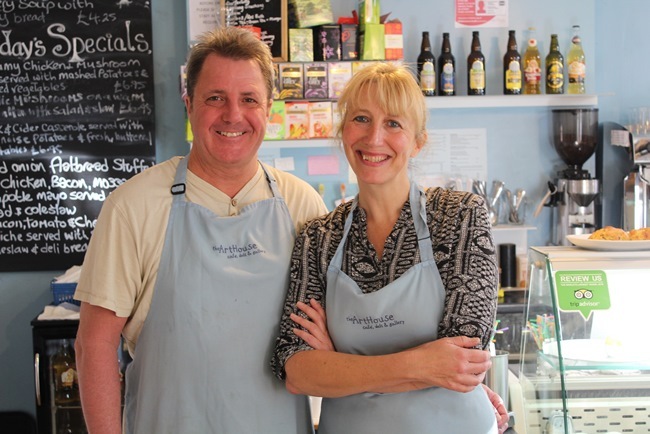 This is the first time Paul and Jane, who both live in the Penistone area, have run their own business. Paul, 60, previously worked in customer services in the banking sector and has spent the last ten years setting up call centres in India, South Africa and the Philippines. And Jane, 50, has a career in lecturing behind her, leading courses in cookery and nutrition at Altrincham College in Manchester, and health and well-being at Barnsley College. Arthouse Café employs 17 people and recently appointed a new chef Stuart Brackenridge, who previously worked at Rivington Hall in Bolton, where he catered for large weddings and developed a reputation for canapes. His expertise is being put to good use in Paul and Jane’s latest innovation, ‘wedding breakfasts’ for the bridal party on the actual morning of the big day. Paul and Jane’s new café menu will feature more fish, gluten-free, dairy-free and sugar-free cakes, all baked in-house, and gourmet burgers. They aim to use as much local produce as possible and have already secured Bradfield Brewery as a supplier of real ales. The Arthouse also exhibits local artists’ works and hosts life drawing classes and ukulele lessons. Enterprising Barnsley has helped Arthouse with online and social media marketing and business coaching. Kevin Steel, Enterprising Barnsley’s business development manager at BBIC, said: “Paul and Jane are working really hard to build this established business by listening to their customers and developing their offer in response – hence the new menu, drinks licence and planned events.